Maple Ridge/Pitt Meadows Cyclist: Our First "Discovery Bike Ride"
Last Saturday morning a group of 16 people met at Big Feast Bistro in downtown Maple Ridge for a little cycling adventure. 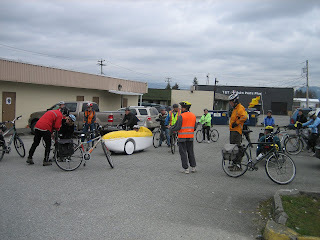 It was the first of a series of Discovery Bike Rides that the Maple Ridge/Pitt Meadows Chapter is organizing this year to explore Maple Ridge and Pitt Meadows neighbourhoods and surroundings, as well as visit interesting businesses, coffee shops and restaurants. These bike rides are also a great way to make some new, like-minded friends. On this bike trip we had some minor obstacles to overcome, but somehow if things don't go quite as smoothly as expected, that makes it more of an adventure and even more memorable. Even before we left, Lucy, one of the participants, found she had a flat tire. Rick, one of the co-chairs of our VACC Commit tee who was there to see us off, helped her quickly fix it, so that we could be on our way. We started off mostly on quiet neighbourhood streets in eastern direction, crossed Kanaka Creek at the Rainbow Bridge, and followed an off-road gravel path along the Albion Flats, continued behind Planet Ice, and via the parking lot at the Albion Sports Fields we reached 240th. We crossed Lougheed Highway to visit a small company, Rainforest Design, that's located just south of the railroad crossing. The owner of the company, Steve Schleicher, was attracting a fair bit of attention as one of the participants of our ride. That was because he wasn't riding just an ordinary bicycle, he was riding his bright yellow velomobile, which is basically a tricycle with a fiberglass encasing built around it. 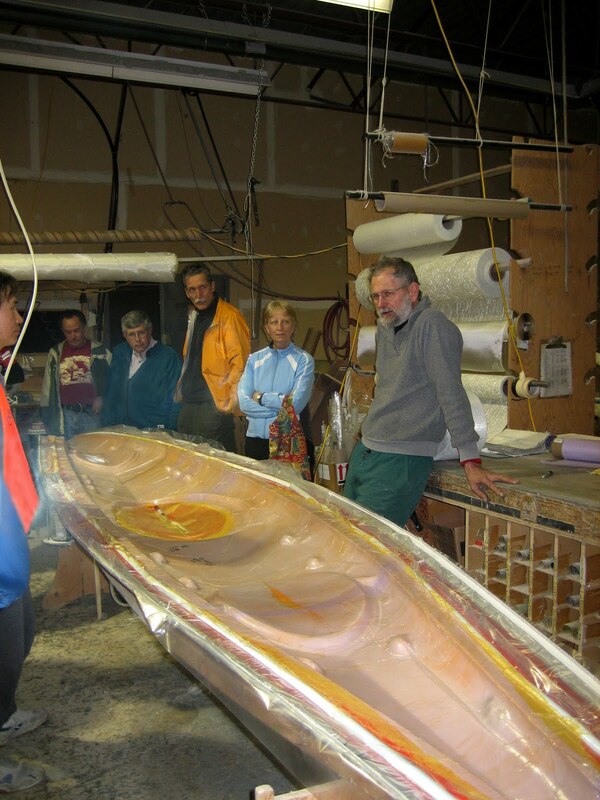 Steve's company designs and manufactures these sleek-looking, aerodynamic, nifty, human-powered vehicles, as well as high-end kayaks. Steve kindly gave us a very interesting tour of his workshop and explained in short the process he uses to make his velomobiles and kayaks. After the tour it was just a short distance to Kanaka Creek Coffee, our next destination. This is a neat neighbourhood coffee shop, where they may just serve the best coffee in town. After coming in from the cold it sure tasted heavenly to me. The yummy pastries and the cozy atmosphere also contributed to the fact that none of us was in a hurry to get up and get going again. But with our tummies filled and our hands and hearts warmed, and ready for the rest of our adventure, we finally mounted our iron steeds again to discover what else was ahead of us. We rode through some newer neighbourhoods that made some of us realize that Maple Ridge has been expanding farther and faster than we thought. We started heading back, taking a different route with several unexpected gravel-path short-cuts, where we encountered some more obstacles. At some point a big log on our path had to be moved, and at another Steve needed some help manoeuvering his velomobile to get around some staggered gates to get onto a short steep path going down to a small bridge crossing Horseshoe Creek. He managed to follow us everywhere we went. Sometimes I already have a bit of a problem on my regular bike, with my mirror sticking out of my handlebar, and my big paniers that I purchased a few years ago in Holland, which serve me really well to carry my groceries, but sometimes make it more difficult to navigate between gates or poles that are supposed to keep motorized vehicles out. We continued in northern direction along Creekside, through the Cottonwood area, crossed Dewdney Trunk Road, and then got onto the signed "123 Route" in eastern direction. 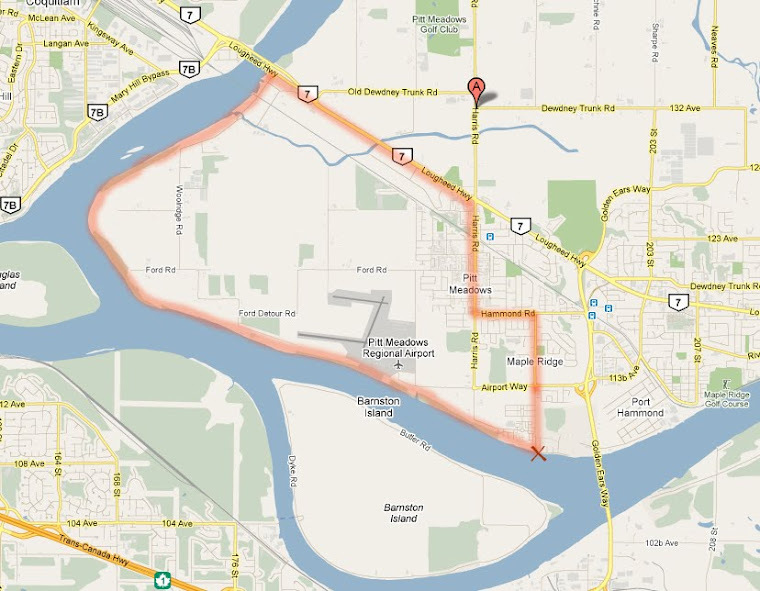 This route leads all the way to 203 St., north of Dewdney Trunk Road. We didn't go that far though. After about 20 kilometers of pedaling we were ready for lunch, and so we stopped where we had started, at Big Feast Bistro on 227th Street, where Chef Mike Mulcahy was ready for us. One problem with his menu is that there are so many interesting and delicious dishes that it's difficult to make a choice. So far I've thoroughly enjoyed all the dishes I've tried though, so it's not a big problem. Just close your eyes and pick one! Some of the feedback received after this ride: "Today's cycle in MR was super"..... "Had a GREAT time! Looking forward to the next one already." Anyone who would like to join any future Discovery Bike Rides is welcome. We're catering to the average cyclist, and try to ride mostly on quieter neighbourhood streets and off-road paths. There is no cost involved, and you don't need to be a member of the VACC. We will be planning our next ride in May in Pitt Meadows. In June we will be organizing a ride exploring part of the Central Valley Greenway, which connects all the way from New Westminster to Downtown Vancouver. For those who would like to be on the e-mail list of our local chapter of the VACC - so that you can be kept informed of any planned rides and other events or issues of possible interest to Maple Ridge/Pitt Meadows cyclists - please contact Jackie at jchow23708@yahoo.ca. Our Discovery Bike Rides will be announced in the community events calendar of both The Times and The News as well.